KATIE: Cheetos in the morning sun??? WAFFLES: Yeah? What's wrong with Cheetos in the morning sun? I like Cheetos in the morning sun. Maybe I want to marry Cheetos in the morning sun. KATIE: So Waffles, where exactly did you get your new mouse. Mail Order Cheeto-Brides? WAFFLES: Nooo. I got her online. The man in brown shorts brought her right to the front door! And she came with lots of cool gifts too. She must have wanted to make a really good first impurression. KATIE: I hate to break it to you, Waffles, but your mouse came in our new KitNipBox, one of the cool, new monthly goody boxes exclusively for cats. 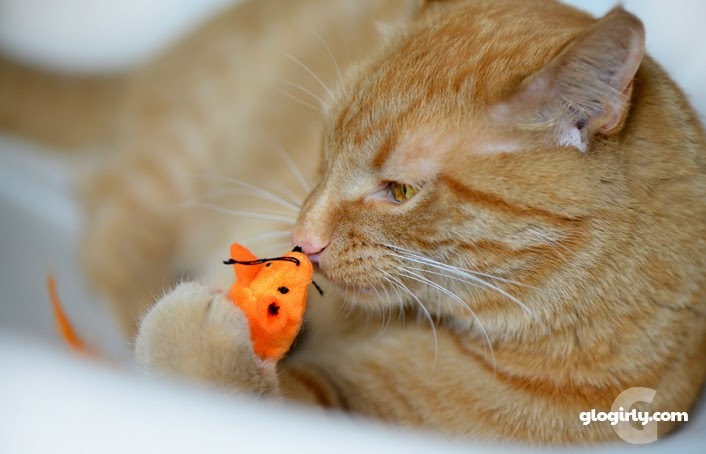 So you're not the only cat in the world that has a new orange mouse. WAFFLES: Yeah but... she's MY orange mouse. And she only has little beady eyes for me. And I love her. KATIE: Whatever you say, Waffles. The KitNipBox people certainly know the way to a cat's heart! Our goodies were beautifully wrapped inside a purrfectly sized box with a sweet little thank you card for Glogirly. There are a number of subscription goody boxes in the marketplace, and KitNipBox is setting themselves apart by offering special and unique products that you might not find in the big box stores or strip malls. KitNipBox works with small businesses and artisans to bring together a wonderful sampling of cat goodies. Many of the brands and artists they partner with donate a portion of their proceeds to rescue organizations in their communities. Comes with one-two goodies valued at $15. Comes with five or more goodies valued at $30. Comes with seven or more goodies valued at $40. Shipping is free for all KitNipBoxes within the continental US. Shipping to Canada is available for a fee. ... so what's in OUR box??? This adorable little toy is hand crafted by a pair of artisans in Warrenton, Virginia. Each flannel strawberry is filled with organic bamboo and organic catnip. Waffles and I LOVE playing strawberry floor hockey with it! No grain, gluten, soy or dairy. 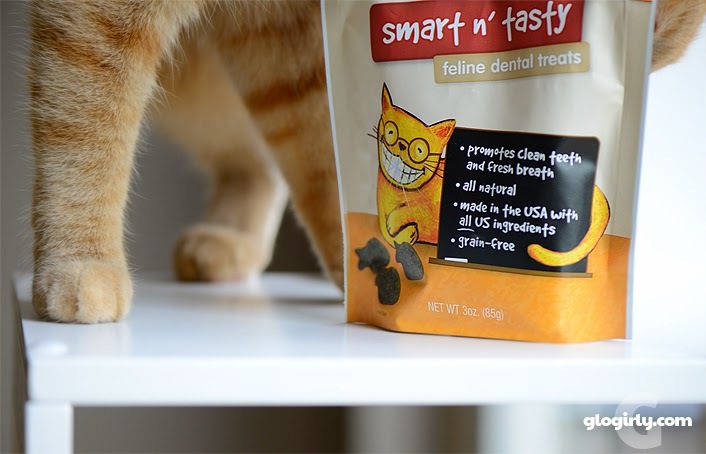 These made in the USA crunchy treats are yummy and can help to fight plaque and tartar. Human-grade and made with cage-free turkey and eggs, this human-grade food is safe for both kittens and adult cats. We also like to sprinkle a little bit on top of our canned food as a treat. We're huge fans of Feliway and use it everyday. The natural pheromones help to bring a sense of calm to an otherwise stressful environment. These convenient wipes can be used to wipe down a carrier before a vet visit or to create a calming space at home. ...like away from Waffles. Stuffed with organic catnip, wearing a long feather tail...and according to Waffles, the color of Cheetos in the morning sun, this little mouse is everycat's dream. Waffles is hoping for a fall wedding. Made from renewable plant fibers and colored with food safe dyes, the cute little whale is perfect for batting around in the bathtub...sans water please. How Did We Like Our Box? All Paws Up! One lucky GLOGIRLY reader will win a Happy Cat KitNipBox for themselves AND one for a US 501(c)(3) shelter of their choice. Though the prize can only ship to a US address, we'd like to invite all of our readers worldwide to enter. Should the winner chosen live outside the US, they will have an opportunity to gift their prize to a US friend or another US shelter. Just enter promo code GLOGIRLY15 to save 15% off of your order now through September 15, 2014. We received our KitNipBox to try out at no charge. We also received a small fee to cover the time it takes to photograph the product, write the review and administer the giveaway. Receiving the goodies and fee did not influence our article or anything we say. We only feature products and services on GLOGIRLY that we love and use. All sponsored posts on GLOGIRLY reflect our honest and unbiased opinions. Well a mancat can dream, can't he? Everything looks just wonderful! That strawberry is adorable! My cats have been wanting to get one of these boxes. And I'd love to share with my favorite shelter. I know some kitties who would love this box of fun! I have a kitty 'The color of Cheetos in the morning sun' who would love that strawberry goody! Why can't Waffles have a Cheeto? Cheetos are yummy!! We let Jewel have one when we eat them around here. If we don't give her one, she'll come STEAL one, MOL. That's some great stuff!!!!! We'd like to see Waffles eat a Cheetos .... See how much orange powder he gets on him!!!! MOL!!!!! Oh, that's some pawesome stuff in that box. We love that they have unique things that you can't get in a big-box store. Be careful Katie! You might end up in a Cheetos colored bridesmaid gown! Carrying a bouquet of Cheetos snacks? Yikes! I'd like to win a KitNip Box for myself and Stray Cat Blues Rescue...thanks so much! What a great gift box! We'd love to win one! That's a great package. We'd love to win one of those. That KitNipBox is a great way to try out things and get some cool toys! I'd love to win for my cat Desiree and the All About Cats Shelter. I think my little Thunder would just love this! Dat box is da bomb. We would like to win one for us kittehs and one for Human Society of Allen County. What a cool box. If we won, we'd share it with the Humane Society of Warren County. Meowm has been looking at these and so wants to do this! Hopefully we will be winners! 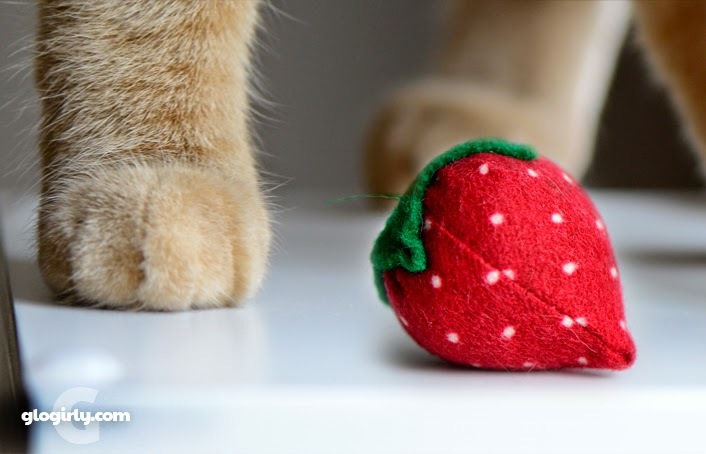 We absolutely adore the photo with the strawberry and Waffles paw! Waffles in the first picture, "How do I love thee mousie, let me count the ways, one, two, chicken...."
That looks like a fantastic box of goodies and a super pawsome giveaway. ps -now Mom wants cheetos and she can't have them! Those are some nice things. 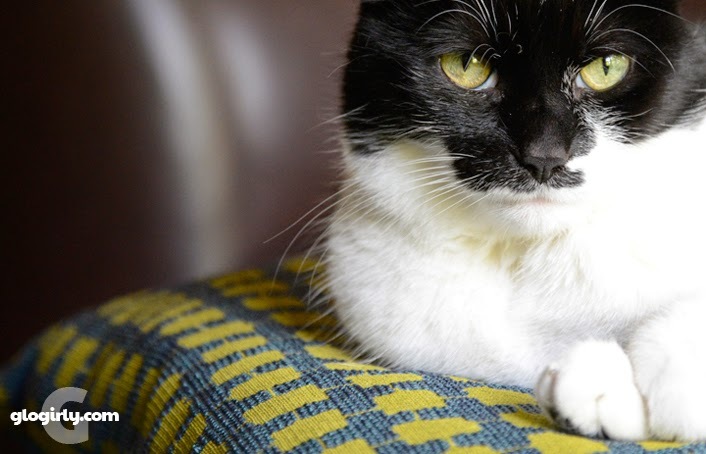 I would like to win for Blind Cat Rescue in N.C. Thanks for the giveaway. My kitties are toyahooics! They would love these. If we win, we'd like the second box to go to Heaven Can Wait in Las Vegas. We would give to SW MO Humane Society, thx so much!! 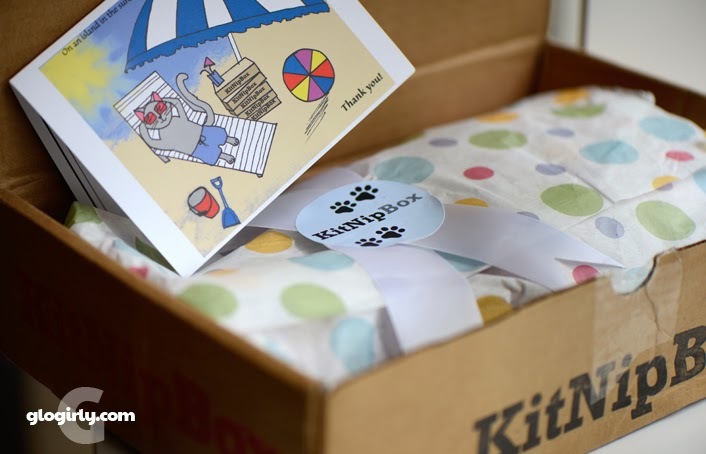 We'd never heard of KitNipBox but they sure sound like a great company. I'd love to win for my 4 kitties. I'd choose The Charleston Animal Society for my shelter of choice. Thank you, GloGirly! The box is great. My furbabies would be over the moon with it. The old man would love the dehydrated food and the little girl would love all the toys. Since all toys are hers and no one else. Will have to order one of these for my babies. Oin! It´s really a love case!!!!! We would give it to the Humane Society of South Mississippi. Our pals at PAWS in Montclair, NJ! That is a great box of goodies. Oh, do we have cat friends who would LOVE a box of goodies like that! Have fun with your mousie, Waffles! May we give both boxes to Feline Rescue of St. Paul if we win? We would love to do that! We'd like to give it to Purrfect Pals in Arlington, WA. Of course my own cats, Koneko, Moko, and Arata, would love this. I'd love to send one to Tree House Humane Society in Chicago, IL. They specialize in cats. I wanna win one for ME! Heeeee. I’d love to win one for A Call 4 Paws! Hey, Waff, are you gonna name your orange mouse Cheeto? All the really cool cats are naming their fave toys. Send me an invite to the wedding, Waffles! I wonder what style dress the bride will wear? What will the wedding colors be? I'd love to win a box for Robin's Nest, a rescue in Schnectady, NY. What a cool idea, and I love the cheeto mouse!! Hey, Waffles, sneak over for a visit. I know where the Cheetos are, and I'll slip you a few. But, hurry, I might eat them all. PS - If my human wins something, I'd like it sent to Feline Rescue. I have friends there! OMC Weez wuld luv one of those. Suwe looks like yous enjoyed it too. I'd love to win for my favorite charity, DCIN (Diabetic Cats in Need)!! We would give to PALS a small shelter in Spencer, MA who helps so many cats in need with little resources. Adore the toys in your sample box. Would share with Angel's Wish, should I win. You mean the kids could have a Cheetos mousie of their very own..Wow..I gotta see what it looks like in the morning sun..MOL..And I can give a box to the shelter kitties..They would have such fun!! This is wonderful to know! I was sad after Best Friend Box and Pawalla went out of business. It's good to have a subscription option again. my local shelter would love this. My newest baby boy Wizard! You guys have the best giveaways. We'd share our box with our friend susan and her kitties. We would love to win this for our kitty Turbo! I would love to win this for my 5 firkids! For my darlin' puss, Leonardo! I would love to win a box for my 3 little furry ones... Nikita, Eugene and Blanca. Getting new toys is always so much fun!! I would love to win this for my three boys: Boots, Baby, and Midnight. 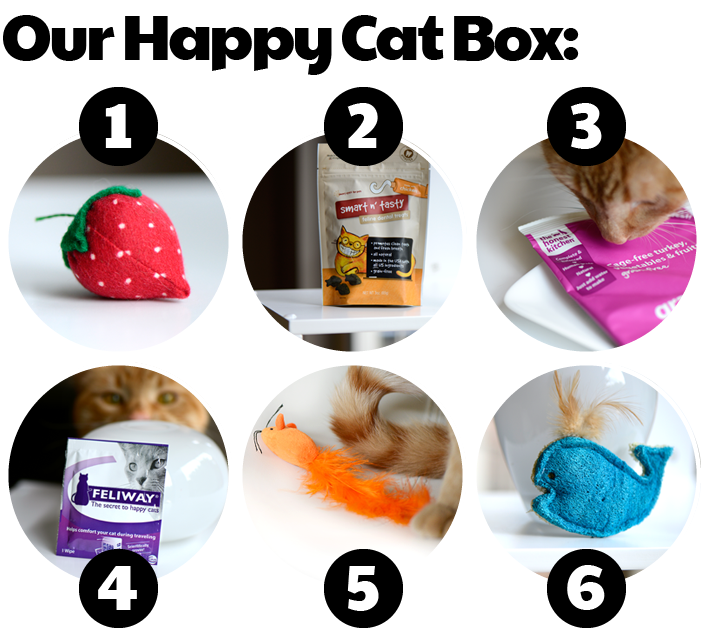 There are 7 of mine in the house who would love to win a KatNip box! Also, our local shelter, Cowley County Humane Society, would be honored with the gift. Oh my goodness, we'd be so excited to get a Kit Nip Box! We love toys, treats, and new things! Waffles and his Cheeto mouse = HILARIOUS. She only has "beady eyes" for him. Ha ha ha! I'd like to win a kit for King Street Cats in Alexandria, VA.